It's March and the signs of spring are blooming everywhere on campus. Daffodils here, cherry blossoms there. Campus feels new and fresh again. And yet, it's a very busy time as students focus on completing assignments for the end of term. 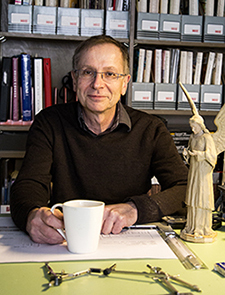 In April, we'll say good luck to our graduating students, and this year we'll also say goodbye to one of our long-time faculty members as well, as design professor Allan Stichbury retires from the Department of Theatre. He leaves for you his last "flower," his beautiful Mississippi-inspired set design for Summer and Smoke. Read more about the first and lasts around the Phoenix. Behind the Scenes: Firsts & Lasts: Learning a new art and leaving behind a legacy. The Phoenix Theatre’s final play of the 2015/2016 season, Summer and Smoke, is a production of firsts and lasts for director and MFA candidate Alan Brodie and set designer and Theatre design professor Allan Stitchbury. Brodie is a highly acclaimed Canadian lighting designer who has designed over 300 plays, musicals, operas, and dance productions and his work has been seen on the stages of all Canadian English-language regional theatres. Two years ago, after 25 years in theatre, he decided to go back to school and enrolled in UVic's Department of Theatre for his masters in directing. Although Summer and Smoke is not Tennessee Williams’ best-known work, Williams himself said that Miss Alma Winemiller, the central character of Summer and Smoke, “may very well be the best female portrait I have drawn in a play.” The play's protagonist, Alma, is a minister's daughter who struggles with feelings for her self-indulgent neighbour John. Their bittersweet relationship is heartbreaking and poignant and Williams' tale about the classic struggle between body and spirit has stood the test of time. 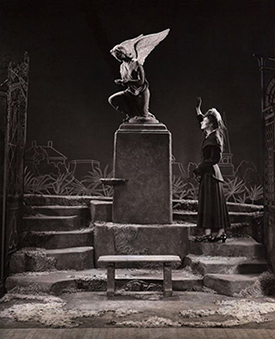 With a bittersweetness suitable to the play itself, Summer and Smoke marks the last Phoenix production for set designer Allan Stichbury before his retirement from the Department of Theatre (shown below with angel model for the play). Stichbury has been a professor at the University of Victoria since 1988, and has balanced a successful career as a professional designer and teacher. Allan’s path to theatre was a little circuitous, but it started right here at UVic when a summer traveling across Canada landed him in pre-law courses in Victoria. Through friends, he saw his very first play here at UVic. Switching into Theatre courses, he took up acting and learned how to design and build sets, working with then-design professor Bill West. He realized that he loved it – so much so, that he dropped out of school after second year and began working at Victoria’s Bastion Theatre. After two years, this work experience solidified his resolve to return to school for theatre design, this time at the University of Alberta. Since then, he hasn’t looked back. 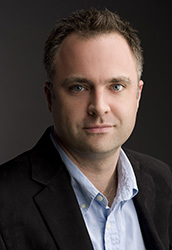 With a career designing scenery and lighting for major theatre and opera institutions across Canada, Allan has also designed shows for Broadway, in Washington DC, and Bangkok, Thailand, where he was influential in establishing a student exchange between Bangkok University and the University of Victoria. As the director, Brodie's research into the original 1948 production of Summer and Smoke, (shown left Eillen Darby Margaret Phillips as Alma), convinced him that he wanted to stay true to the realism exemplified in this production, but in a way that would help translate it to a 2016 audience. For Brodie, he feels lucky to have been one of those Theatre students. "I have been so fortunate to work with an incredible team on this production. Designers, actors, stage managers, coaches, technicians, crew, staff, faculty, supervisors and advisors alike – all have conspired to give me a dream ride on my first major foray into directing." Listen to Alan Brodie talk about making the transition from lighting designer to director on CFUV Radio. Summer and Smoke photos will be available this week our Facebook page. March 8 @ 12:30pm, Phoenix Theatre: The Power of Myth with Dr. Warwick Dobson. Myths, legends and fairy tales are a central part of all cultures around the world. But how can applied theatre practitioners use them to deal with traumas and difficult experiences, and how do those experiences vary in different cultures? Theatre scholar Warwick Dobson will explore applied theatre techniques used throughout his 40-year career as theatre director, school teacher, drama consultant, educator and professor. Event includes a participatory workshop on the story of the traditional Tamil folk-tale, Kandarubia. March 9 @ 11:30am-3pm, SUB: Jamie Cassels Undergraduate Research Awards Fair Connect with the next generation of Canadian researchers! The JCURA awards offer exceptional undergraduate students the opportunity to carry out research in their field of study. The Fair will feature over 100 of these inspiring projects, ranging from the latest in biomedical technologies to the politics of decolonization, and includes the work of 3rd-year theatre student Nicholas Guerreiro. See a description of all Fine Arts events during Ideafest. MFA Candidate and director Alan Brodie speaks about Tennessee Williams and the play. This free lecture is open to all (no matter which night you have tickets for) and will be recorded for podcast. Summer and Smoke is Tennessee Williams at his most passionate. Welcome to Mississippi at the turn of the 20th century and the small town of Glorious Hill. Alma, the daughter of a small-town minister and eccentric mother, harbours a life-long infatuation with her restless and self-indulgent neighbour, John. Alma and John’s struggle between body and soul, anarchy and order, love and lust leads to profound changes in both their lives. A true American masterpiece, Summer and Smoke is a bittersweet exploration of love and longing with unforgettable characters that break our hearts even as they touch our souls. Box Office is now open for single tickets. Share Summer and Smoke event on Facebook. 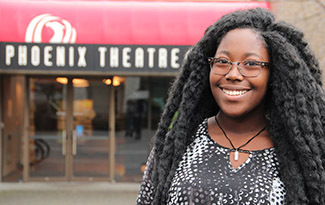 We are proud to announce that our second-year student Ann-Bernice Thomas was named Victoria’s Youth Poet Laureate! Mentored by the current adult poet laureate, she will write and recite new poems at council meetings and youth council as well as participate in poetry readings at City of Victoria and Greater Victoria Public Library events. As part of the position, Ann-Bernice receives a $1,750 honorarium and another $1,000 for project funding. Read more about Ann-Bernice in the Times Colonist article. Congratulations! In February, alumnus Andrew Barrett (BFA’12) and his company Impulse Theatre collaborated with alumna Kathleen Greenfield (BFA’05) to present the first workshop of their newest project, The Hunt, as part of the Intrepid Theatre’s You Show series. 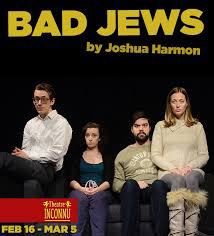 Matt McLaren (BFA’14) directed Theatre Inconnu’s production of the Off-Broadway smash hit Bad Jews. The production also featured current student Kat Taddei as Daphna. He was interviewed by the Times Colonist in Feburary. Ian Case (BFA’91) and UVic Writing MFA Karen Lee Pickett collaborated on the script for Craigdarroch Castle and the Greater Victoria Shakespeare Festival’s production of Where There’s a Will. The production celebrated Shakespeare with song, verse and cake in honour of the 400th anniversary of the English playwright’s death, and also featured alumnus Cam Culham (MFA’03). Alumnus Matthew Payne (BFA’96) organized ConVerge, part of the Victoria Film Festival, earlier this spring. This portion of the festival used a variety of unconventional venues such as City Hall’s attic, Trounce Alley, and the Bay Centre fountain to display films to the public in unique and innovative ways. As Theatre SKAM’s founder and Artistic Producer, Matthew also just celebrated SKAM’s 21st anniversary with the company’s annual Birthday Bash. Just opened this week at Langham Court’s production of Female Transport features several Phoenixers including current student Taryn Lees as well as alumni Graham Roebuck (BFA’11), Sarah Cashin (BFA’15), Melissa Taylor (BFA’14), and Ian Simms (BFA’14). Alumni Chris Wilson (BFA’08) and Peter Carlone (BFA’08), otherwise known as Peter N’ Chris, will be performing their hilarious “whodunit” detective story spoof Peter N’ Chris and the Mystery of the Hungry Heart Motel at the Cowichan Performing Arts Centre on March 11. The award-winning comedy duo performed this very play at the Phoenix to sold out crowds in the fall of 2012. 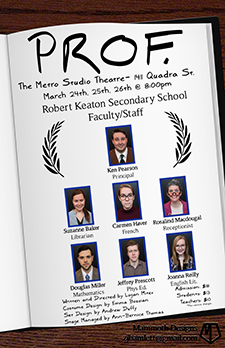 Back in Victoria at The Metro, alumnus Logan Mitev (BFA’15) premieres his new play Prof., from March 24-26. It features a host of Phoenix students and alumni including Dallas Ashby, Kieran Dunch, Sean Dyer (BFA’15), Kevin Eade (BFA’14), Emma Grabinsky, Laura Rasmoso, and Rebecca Waitt in the cast, as well as design by Emma Bozoian and set by Andrew Duffy. This summer, alumna Mika Laulainen’s (BFA’12) play Wild Society will be touring Canada as part of the National Fringe Tour. Mika’s company, star star theatre, won the national CAFF touring lottery competition and will be performing in Toronto, Winnipeg, Calgary, Edmonton, Victoria and Vancouver. If you find yourself at any of these upcoming Fringe Festivals, make sure you see it, and keep an eye out for our August eNews for a full list of Phoenix Fringers! Want more alumni updates? Check out the Alumni Profiles area of our website. Email your alumni stories to us to be posted here in future eNews. Theatre alumni are also invited to join the Phoenix Alumni Network Facebook group.